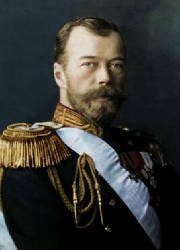 In 1894, Nicholas II became Czar. He was very dedicated to autocracy. During his reign, Russia industrialized quickly, although it had still hot caught up to western nations like Britain and Germany. Because of the industrialization, jobs did not pay well, and working conditions were substandard. The workers were very unhappy with this, but lacked the political power to change it. Several terrorist and revolutionary factions existed to overthrow the czar or force a change. One of these groups was called the Bolsheviks, led by the one called Lenin.